Around 1855, the DuPont Company established aa water-powered powder mill on Big Wapwallopen Creek in the valley of the Susquehanna River's North Branch, on the east bank, and about five miles north of Berwick and Nescopeck. Blasting powder for the anthracite mines of the Wyoming Valley, about 15 miles to the north, rather than munitions, was the principal product. The widely-distributed F W Beers atlas of 1873 shows a rail line from the river to the mill, but no connection, as the Pennsylvania Railroad's Wilkes-Barre Branch wasn't extended northward from Catawissa to Wilkes-Barre until 1880. A centennial history(1999) of American Car and Foundry, which maintained a large plant in Berwick for many years, shows a proto of a presumably-wooden boxcar for the Wapwalopen(sic) Railroad. but no mention is made of possible interchange arrangements. DL&W forerunner Lackawanna and Bloomsburg laid rails along the river's west bank as early as 1856, but how (or if) those shipments found their way across the river to Hicks' Ferry and the L&B or possibly, the parallel Pennsylvania Canal - less fire/explosive risk - isn't clear (Carfloat technology had been used as early as the Civil War, on the Potomac and under the tutelage of General Herman Haupt). The mill closed in 1914, but the relatively-isolated site remains a popular, but unsupervised swimming spot, known locally as the Power Hole, overlooked by the remains of a substantial girder bridge. So maybe, a little deeper inquiry beyond the usual local sources can turn up some more specifics. A little research during a post turns up something! Anyone have the exact location or map of where the old railroad bridge is over the creek at "Powder hole"? Was that part of the Powder works railroad? Last edited by talltim on Mon Jan 14, 2019 12:13 pm, edited 1 time in total. Here's a map of the Dupont railroad from 1873 that I found. Also note that while the the main map shows the main railroad line, the detail doesn't! Last edited by talltim on Tue Jan 15, 2019 4:51 am, edited 1 time in total. Look at the very upper right corner of the map I posted above. Shows the DuPont RR not connecting to anything. Must have been barged from there on the river of canal. 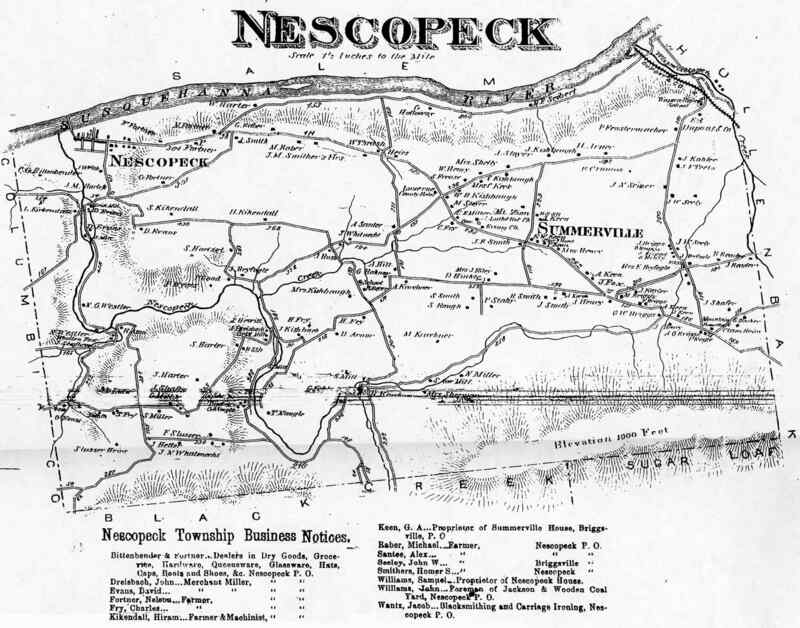 The boundary line between the townships of Nescopeck and Hollenback follows Big Wapwallopen Creek, but only for about a mile. So it would apppear that much of the DuPont complex was in Hollenback Township. The SCRIBD article, by local historian Roger Gilbert, and linked in the second post of this thread, provides much greater detail; Page 2 shows an approach to the trestle, and the boxcar shown on Page 8 appears to be a duplicate of that in the ACF history referenced in the original post -- though it likely was built by Berwick-based Jackson and Woodin, a forerunner of ACF. There appears to be no evidence that the loaded cars were ferried across the Susquehanna intact, so the shipping process could have involved possibly two additional transloads, rail to ferry,and from there back to rail or canal boat. as well as the original loading at the mill. CarterB wrote: Look at the very upper right corner of the map I posted above. Shows the DuPont RR not connecting to anything. Must have been barged from there on the river of canal. Interestingly your map shows the line in the west side of the creek, whereas mine shows it on the east.